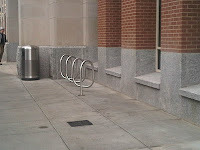 Philadelphia Code 14-1401 (4) requires 1 bike parking space per every 10,000 square feet or fraction thereof. The expansion at 986,000 square feet should have supplied no less than 99 bike parking spaces. It is possible that the Convention Center, an independent authority created by the State obtained all of its approvals before the bike parking ordinance took effect. Still installing 50 inverted U bike racks would have only added about $10,000 to the $786,000,000 price tag. Its interesting to note that the Authority is pursuing LEED Certification through its "Green Commitment" program and adding bicycle parking ranks among the most effective LEED Certification point strategies that one can pursue. While it is nice the coalition has alerted everyone to this problem. What is the BCGP going to do find a resolution? Or is this just another issue that will be ignored. Please surprise me by posting this. Since posts that don't toe the party line never get approved. We do not censor comments that disagree with our policies. We do however reserve the right to not approve comments that attack this organization or its employees. We will be writing a letter to the Convention Center asking for more bike parking. Beyond that will require someone to take ownership of this issue. 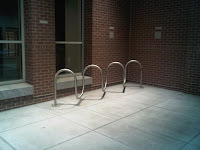 Anyone who wishes to lead a campaign to improve bike parking at the Center should contact us directly or attend the next Philadelphia City Cycling Committee meeting on April 19th, 6:30 PM at the BCGP education office.